Throughout the year, our school celebrates festivals to connect us with the cycle of nature, establish a yearly rhythm for the children, and strengthen our community. The festival of Martinmas is traditionally celebrated on November 11, between the fiery out breath of Michaelmas and the deep in breath of the winter holidays. It honors, in a universal way, the story of St. Martin, patron saint of beggars and outcasts, who was known for his gentleness and his ability to bring warmth and light to those in need. From France comes the story of St. Martin, who as a young man passed under an archway of the city of Amiens and discovered a poor beggar huddled there. The man was barely clothed, and shivering with cold. On seeing him, the young Martin took his cape from his own shoulders, tore the garment in half, and covered the poor man to warm him. The following night Martin had a dream in which he saw an angel wearing this same piece of his cape. The experience confirmed in him his devotion to all mankind regardless of their station in life. Martin went on to become patron saint of beggars and outcasts, and was known for his gentleness, his unassuming nature and his ability to bring warmth and light to those in need. 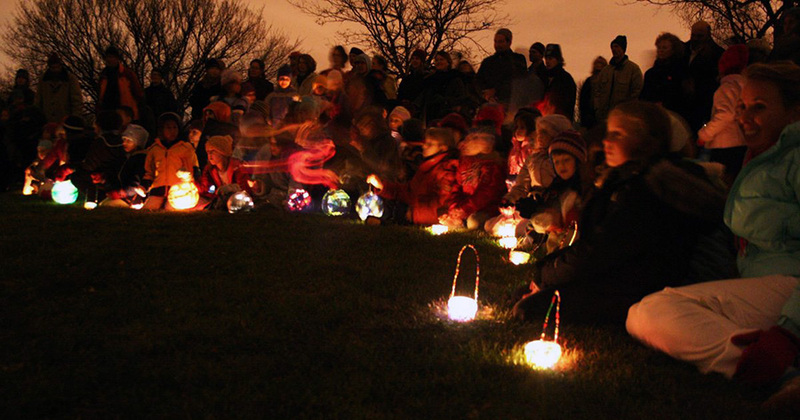 During our annual Martinmas Lantern Walk, children and parents are invited to gather together as the sun sets, carrying handmade lanterns, symbolizing our own individual light. As you leave the Martinmas Lantern Walk, we encourage you to take the mood of the festival home with you. A quiet ride home, followed by supper and bedtime is ideal. Please be sure to arrive 10-15 minutes early to light lanterns and gather with your class. Since this is a quiet, contemplative celebration, please refrain from using flashlights, glow sticks, and cell phones. Juniper: 4:45 p.m. | Maple: 5:00 p.m.
For location information, please refer to the weekly newsletter or class blogs. Below you’ll find some of the songs we’ll be singing together, please have a listen so you can join in!